I, or guest bloggers occasionally write about budgeting, purchases and other money related topics. 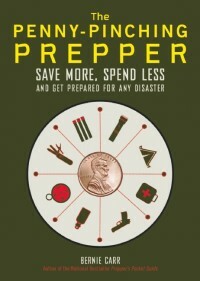 Neither I, nor other writers for Apartment Prepper am a financial advisor. You must consult your own financial advisor or banker regarding your personal situation. We do not give medical advice. Bernie Carr may write about health topics with regard to emergency preparedness but this is not medical advice. We are not responsible for the use or misuse of any product advertised herein. We do not give legal advise at Apartment Prepper. We may occasionally discussed laws in general, however this is not legal advise. If you need legal advise, do not rely on generic information, consult an attorney. Apartment Prepper does not guarantee safety, accuracy, legality, reliability, in any way. We share information for educational or informational purposes. You are responsible for your own actions. Consult an independent expert or specialist such as doctor, lawyer, financial advisor regarding your own personal situation. We do not collect any personal information from anyone who visits this website. The only information that may be collected are name and email address from readers who leave a comment, or from readers who send an email. Collecting this information allows us to respond to your comment or email. If you win a drawing, we only collect your mailing information to allow us or the drawing sponsor to mail your prize to you. We do not store mailing information for marketing or mailing purposes. and i would like to bring the best info’s and tips for them. are on post. I’m sure that my readers will find your posts very informative. understand if you will not approve with my request. Hi Dave, Go ahead and reprint my article. Thank you for your interest. Hi, my wife and i are seniors with a small dog in a sr apt. It is becoming more difficult every day to move. I am on dialysis, and if there is a catastrophic event, i’ll be dead in 10 days. I accept this. But, is there an inexpensive generator for a power back up for a small 2 bedroom apt., on the 4th floor? We do have a small balcony . Battery powered? Hi Michael, A generator for use in an apartment would have to be a battery powered generator, safe to use indoors. Home Dept carries them, here are a few examples: http://www.homedepot.com/s/battery%2520powered%2520generator?NCNI-5 If you have sun in your balcony, a solar generator with some panels might work. I saw a solar one by Goal Zero http://www.goalzero.com/p/140/goal-zero-yeti-1250-solar-generator#reviews I have not tested these myself, but I can see the benefits of having one to run the fridge or a few small appliances. Thanks for posting your question. I HAVE BEEN TRYING TO FIND YOUR ARTICLE wHERE TO HIDE VALUABLES IN AN APARTMENT WITH NO LUCK. I CAN NOT GET OPENED OR FIND IT? I enjoy the heck out of your blog! Keep up the good work! I have found many very good ideas on this blog site. And enjoy reading the posts. I am going back and reading the early ones that I did not read before. And yes keep up the very good work. you might to do a post of fire extinguishers there is a lot to know about them and how and when to safely use them. Hey oldguy, I really appreciate the encouragement. Comments like this keep me going with this blog. Thanks for the idea, I am adding fire extinguishers to my upcoming article. I appreciate it! I know you in to reusing items. Last weekend I spent some time with one of my grandsons making “buddy burners” for his Boy Scout camping trip. We made them out of empty tuna fish cans, cardboard and wax. I used broken candles and candle stubs and old broken crayons for the wax. You do not want to use scented candles for this. You cut the cardboard the height on the tuna can and roll it so the corrugations are up and fill the cans with it, the fuller the better. Than melt the wax (always us a double boiler) and pour the wax slowly in to the can/cardboard till it is full. I stuck a piece of candle wick in the center of the can to help when lighting this. These will burn for about 2 – 3 hours and can be use to cook over. I took a empty larger can and bent a funnel in to the edge of the can and melted the wax in this can. I used an old pan full of water and three nuts in the bottom to hold the can off the bottom of the pot as a double boiler. You do not want to use direct heat melting wax (very bad – old past experience of a wax fire). Leather gloves are recommended to handle the melting can. And a scrap piece of cardboard under the cans you are going to fill are very good ideas. Makes the clean up a lot easer there will be spillage and over runs when you pour. This is one way of reusing items that are generally not thought of. Any shallow can metal works for this, like chip dip cans. Hey old guy, This is a great idea! If you don’t mind, I’d like to repost your instructions (from this comment) as an article on how to make buddy burners. I will credit you as “reader contribution” as we always protect privacy as much as possible. If you have any photos, please send them over. Thanks!! sorry no photos. I would just say to look for articles on the web showing how to make them. Thanks for considering it. I appreciate the response. I do not like candles for emergency lighting. I have seen several fires started by unattended candles. With this all said I do believe that candles in a tempered glass jar are safer. But after looking at them in the store I found that there cost was high and most were scented candles. I did find some religious candles at one “Dollar Store” that were not too costly or scented. What I do now is buy cheap candles at Good Will store that will fit in to a large mouth canning jar. I cut the candle off at the height of the jar and then but the jar and candle in to my old pan filled with water with 3 three nut in it. This acts like a double boiler to keep the jar away from direct heat. Heat the water up till the candle slumps down fill the jar fully. You DO NOT heat the candle up to a full melt. Just enough to make it spread out and fully fill the jar. This will cause some space at the top of the jar that will be used latter. This should only be done with tempered glass canning jars. I pull the jar out and let cool I now have a candle in a tempered glass jar. I take my vacuum sealer with the canning attachment and vacuum pack a book of matches in on top of the candle with a canning lid and ring. That way in an emergency I will have the matches right with the candle. I buy candles at Good Will that will slide in to the canning jars. I find the canning jars cheap at yard sales for this you do not need a good top seal edge so it is a way to use your older canning jars as well and you also can reuse the canning lids too. To add to my security in my apartment I have done several things. The first thing I did was to replace the short screws on the door striker plate and dead bolt lock plate with 2 inch long screws in the jam. I also changed the short screws on the hinges into the jam with 2 inch screws too. I use the same type of brass screws as the original so this change was not notable to the building superintendent. You will need to drill pilot holes for that long of a screw. I use my rechargeable drill for this and driving the screws. This was quick work of the change. Just do one screw at a time and the plates will not move as you are working. (I did the changeover on a Sunday at 3:00 AM just be sure to vacuum up any wood chips from the drilling). I found a scrap piece of clean 3/8 plywood and had it cut down of it will just fit on the inside of my apartment door and added two pieces of wood across the face of it. I cut it out to clear the door handle and the dead bolt and the door peep hole. I have two of the rubber footed door security bars (Mace brand “Jammer Home Security Door Brace”) that are adjusted to fit under the two pieces of wood screwed and glued to the piece of plywood. I have the plywood stored under my bed with the security bars. If I need to secure my door (which is a cheap hollow core interior door) I will place the piece of plywood against the door and use the two security bar to brace it. While the piece of plywood does not fully cover the whole height of the door it covers 80% of the door height. This will make braking the door in a lot harder. And there is no damage done to the apartment that I will have to pay for. Have you ever look into “fire escape hoods”. I know that you can take them on to airplanes. Most of them have a fire resistant hood that goes over your head and a filter to breath through.